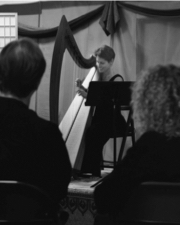 Anne Roos and her Celtic harp are featured at a special private house concert in South Lake Tahoe, California. This performance includes enchanting Celtic music, plus a few modern surprises and special guest musicians (to be named as we get closer to the date). Join Anne as she weaves magical music with delightful stories, all on an intimate living room stage! Doors open at 6:30 pm with home-baked dessert and tea or coffee. Concert starts at 7 pm. Anne will be available to sign her CDs so that you can take a souvenir of her harp music home with you. To attend, please contact Anne Roos directly for more information.